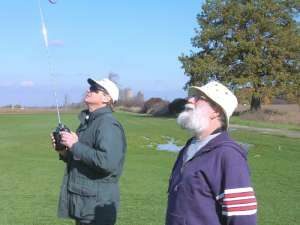 Question: Is it possible for me to teach myself to fly radio controlled model airplanes? Answer: Probably not; at least not without several crashes along the way. This answer is based on the repeated experience of many otherwise talented individuals. Supply launching tackle during your training period, if you need it. Teach you safe flight procedures. Help you to set new goals, so that your skills continue to improve. Optional teaching tools include a “buddy box” control panel, operated by the student but linked by umbilical to the Instructor’s transmitter. 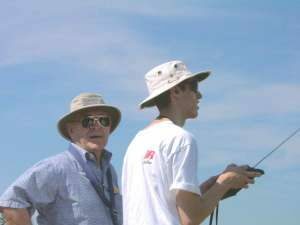 By flicking a switch, the instructor can intervene to save the student’s airplane. Small, inexpensive, electric-powered, Styrofoam “park flyers” are sometimes used for instruction. Although not high performance models, at least they are fairly tolerant of hard landings. And if the damage is severe, your loss is minor in terms of dollars, time, and effort. Once you become proficient flying such models, your transition to more expensive performance sailplanes can be made with less risk. Constructing a model airplane appeals to many people, and there are lots of sailplane kits available that combine low cost, with easy construction and great flying qualities. Or you may prefer buying a Ready-to-Fly sailplane. Either way, our instructors can suggest some popular designs, and offer construction or assembly advice. Installation of the propulsion and control systems is a frequent source of problems, where a little help can go a long way. SOGGI endorses the use of computer flight simulators. Simulators can shorten your learning time significantly with respect to recognizing and controlling your model’s orientation. However, you should be aware that there are a multitude of real life hazards that generally aren’t part of simulations, and which generally don’t become apparent until after you are airborne … for example: blinding sunlight, changing wind directions, confusion as to which of the several airplanes in the sky is yours, creatures wandering into your landing zone, flyaway models, or problems with visual depth perception. These hazards sometimes reveal themselves within seconds after launch, and can quickly overwhelm the uninitiated. Our Instructors teach students disciplined flight procedures, so that they can recognize and avoid these, and other potential hazards. We recommend that beginners do not try to fly their “park flyer” at the city park. Few parks have enough unobstructed area for a beginner to fly successfully, and hazards abound.